The father of the Philippine Pinoy rock Joey "Pepe" Smith passed away at the age of 71. 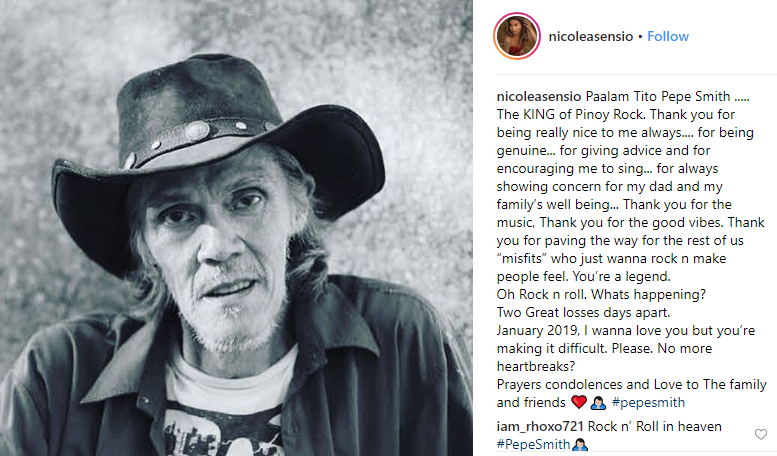 Celebrities and musicians extended their condolences to the bereaved family of the pioneering father of the Pinoy rock. "Thank you for everything papa bear ko. thank you for being the best dad in the world. I know you're in the best place now, no more pains papa.. i will see you in a few days. I love you to the moon and back," his daughter Daisy wrote on Facebook. Paalam at salamat Joey "Pepe" Smith. I was 17 when I first saw you live at 70's Bistro, performing epic guitar solos with Chickoy Pura on Himig Natin that lasted for what felt like 20 minutes. Hebigats, lodi. RIP.